Unfortunately, when Chinese scholars first translated the Bible into Chinese, they chose the Chinese character long (in pinyin) to represent "dragon." 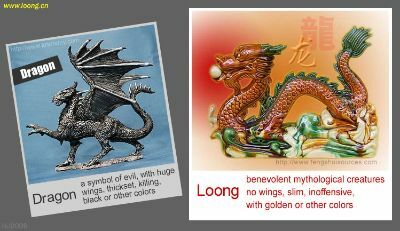 This translation then resulted in the adoption of long to mean "dragon" in Chinese-English translation. When professor Wu claimed that long should not represent the Chinese identity, indignant nitizens immediately fought back. The professor was reported to be heading up a government-funded research project on new symbols for the Chinese national image. Once completed, the project's suggestion is likely to be accepted by the government. In a survey conducted on December 5, shortly after Wu's remarks were reported, sohu.com pooled 75,331 voters, of whom 92.57 strongly disapproved of rejecting long as an emblem representing China. It was clear that Wu's suggestion as was reported missed the point and backfired. The Chinese long is far from being the peer of a dragon, which is "a large fierce, imaginary animal with wings and the power to breathe out fire." Professor Huang Ji, an expert in advertisement with East China Normal University, has been appealing for the adoption of loong as a more appropriate translation for the Chinese character. Huang started an Internet-based campaign for this goal in December 2005 by registering the domains of www.loong.cn/www.loong.us. His research published on this website shows that as early as back in the 1940s, the use of loong in the brand name of a Chinese cigarette was the English translation of long. 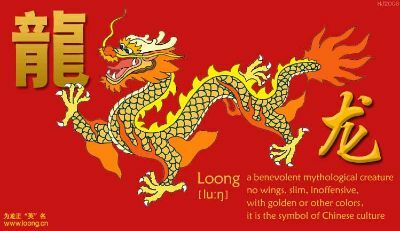 The Chinese character long in kung fu master Bruce Lee's Chinese name was translated as Loong. Huang also published on his website possible definitions of loong. He gave a detailed explanation as the following: "A mythological creature, with the head of a camel or horse, the horns of a deer, the eyes of a rabbit, the ears of a cow, the neck and body of a snake, the belly of a kind of huge clam, the scales of a carp, the claws of a hawk, the palm of a tiger, and without wings. It has whiskers and a beard, and is deaf. It is generally regarded as benevolent but is also the source of thunder and lightning." Du Weiping, a scholar of English literature, told china.org.cn that the suggestion of avoiding the use of long as a Chinese emblem could be labeled as national nihilism. "Long has been used by the Chinese as a national emblem for thousands of years," Du said. "It would be far more rational to change the original Chinese translations of 'dragon' and the English translation of Chinese long. Loong is a very good option."